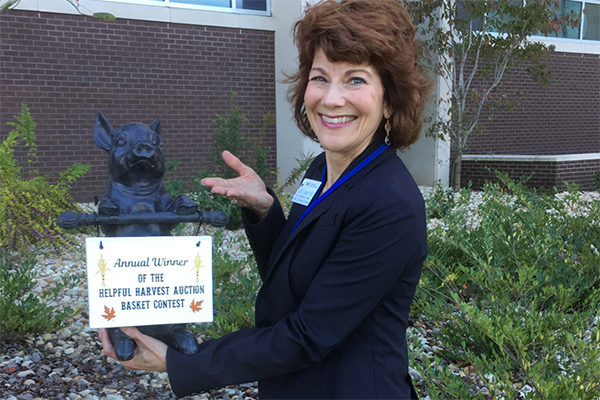 Dr. Carol Adams won the Bronzed Pig Award during last year's Helpful Harvest Auction and Lunch for her themed basket. The award will be up for grabs at the third annual event Nov. 17 at the University of North Georgia Gainesville Campus. Departments across the University of North Georgia's (UNG) campuses will vie for the coveted Bronze Pig Award at the upcoming Helpful Harvest Auction and Luncheon, but students, faculty and staff will be the ultimate winners since event proceeds will be donated to the UNG Gainesville food pantry and for staff book scholarships. Sponsored by the UNG Staff Council Gainesville, the third annual event will be from 11:30 a.m. to 2 p.m. Friday, Nov. 17, in the Cleveland Room (room 3110) in the Martha T. Nesbitt Academic Building. The Helpful Harvest Auction will include a lunch, silent and live auctions, and door prizes from local businesses. Nearly 100 businesses donated auction items, ranging from gift certificates and weekend getaways to attraction tickets and holiday decorations. The auctions also will include baskets from UNG departments with themes such as children, sports, gardening, and romance. A local dignitary will judge them on their theme and award the Bronze Pig to the department with the best basket. 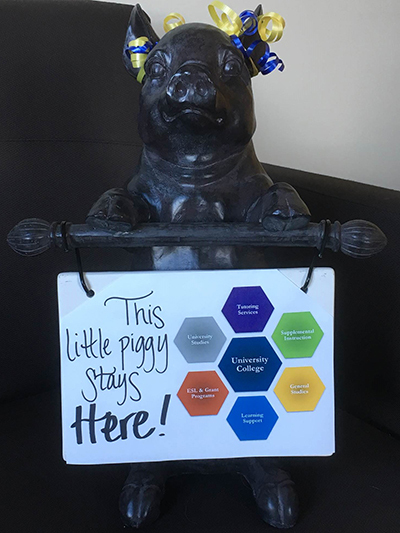 Departments across the University of North Georgia's (UNG) campuses will vie for the coveted Bronze Pig Award at the upcoming Helpful Harvest Auction and Luncheon. Half of the funds raised will be donated to the UNG Gainesville Food Pantry, which supports "food insecure" students, faculty and staff. The other half will provide money for staff who are returning to the classroom as a student. "The Staff Council wants to give back to our community," said Carrie Wills, vice chair of Staff Council. Staff members who are enrolled in the Tuition Assistance Program (TAP) may receive up to $100 per semester and up to $200 per year for the reimbursement of books, Wills said. 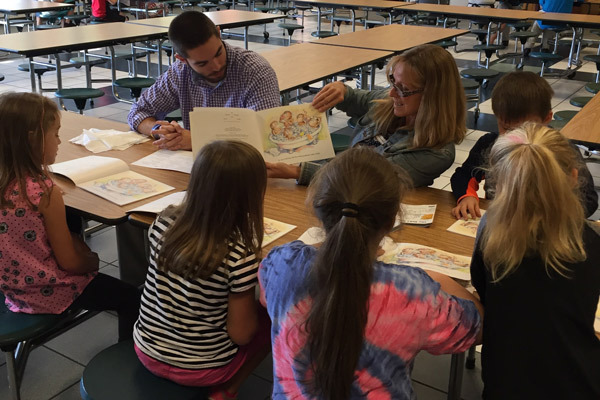 Last year, the UNG Staff Council Gainesville raised $8,400 and donated half for an area nonprofit and half to the book scholarships. 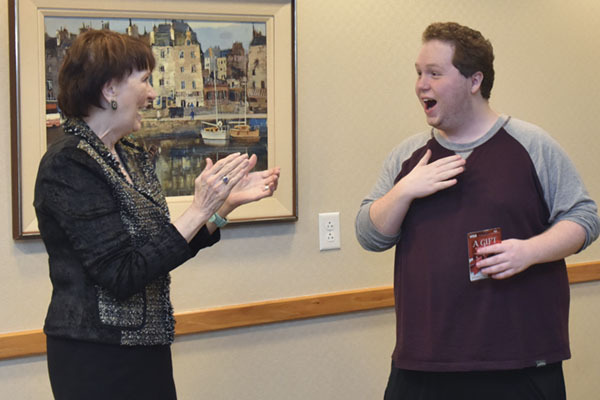 "I'd like for Staff Council to raise $10,000 this year," Wills said. "I think it could happen with some of the auction items we have." Tickets will not be sold at the door. Cash, checks and credit cards will be accepted for purchases of auction items at the event. Checks should be made out to the UNG Foundation. For more information, contact Wills at carrie.wills@ung.edu or 678-717-3881. The UNG Staff Council Gainesville is not alone in planning events. The UNG Staff Council Dahlonega will host its Chili Cook-off and Bake Sale from 11:30 a.m. to 1 p.m. Wednesday, Nov. 8, in the Great Room at Hoag Student Center. Faculty and staff may register online to participate in the chili contest. Tickets are $5 and include a taste of each chili along with a drink. Ticketholders may vote on their favorite chili. Winners in five categories will be announced at 1:15 p.m. Baked goods will be available for purchase. Proceeds from the Chili Cook-off and Bake Sale will benefit the Staff Council Scholarship Fund. For more information, contact Stephanie Hulsey at Stephanie.hulsey@ung.edu or 706-2521. The UNG Oconee Campus will also have its annual Chili Cook-Off from 11:30 a.m. to 1 p.m. Friday, Nov. 3, in the Multipurpose Room (Oconee 522) of the Student Resource Center. Faculty and staff will vote on their favorite chili with the winner receiving an apron. Items will also be raffled off during the event. Raffle tickets cost $1 and chili tickets cost $5. Proceeds will benefit the Staff Council Scholarship Fund. 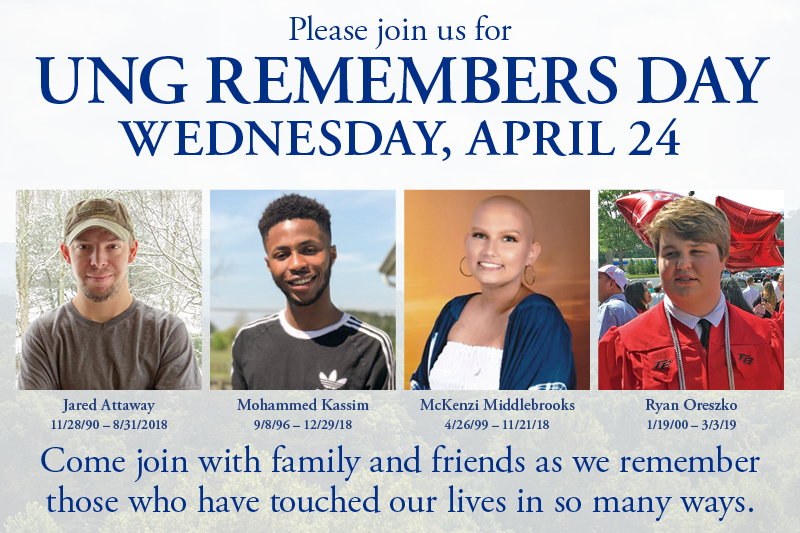 For more information, contact Kate Jordan at kate.jordan@ung.edu or 706-310-6330.